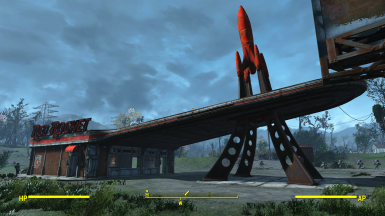 This mod offers a Red Rocket rebuild courtesy of VlitS. Thank you for your hard work! 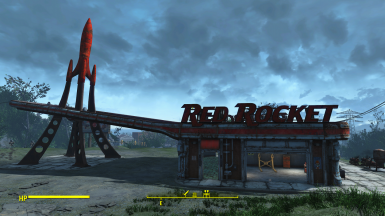 Red Rocket Startup is the second in the series of startup settlement mods that I am going to develop. 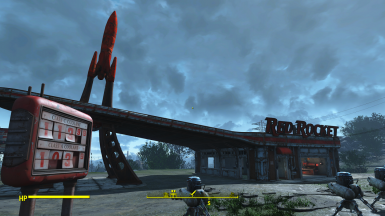 Red Rocket is usually the second settlement for me and I spend a fair amount of time site prepping before moving settlers in. Cleaning up leaves, garbage, trees, cars....ad nauseam.. Well, no more! >Red Rocket is repaired and has no pump arms, courtesy of Repaired Red Rocket by VlitS If you like this mesh, please click the link and give an endorsement! >All of the lights in RR are linked to an emergency light that is stuck to the wall right above the workbench. If you scrap it, all of the lights will go out in RR. 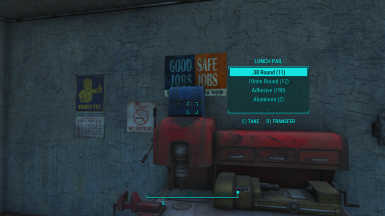 >All of the materials gained by scrapping and the items that were scattered about Red Rocket are located in the lunchbox on the workbench. To get the item list, I loaded a game with no scrapping mods. I performed a 'scrapall' and then retrieved everything that wasn't scrapped. I looked at what was available and then placed those items in the lunchbox. You are not losing anything in the way of materials, you just don't have to do it yourself. >I switched the spit style cooking workbench with the stove style. Mod has been cleaned with FO4Edit.